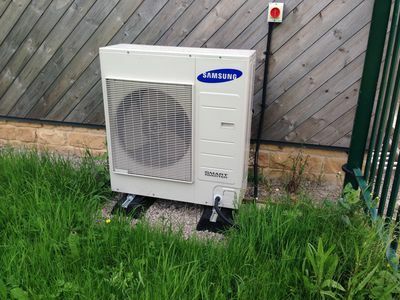 Heat pumps extract heat from one location, the air or ground, and increase the heat produced by up to 400%. This means for every unit of electricity used by the heat pump you will get 4 units of heat in the house. They can provide huge savings and reduce energy bills by up to 80%. The energy produced is transferred to produce hot water and or heating/cooling. These pumps collect energy from the ground and make use of the stable all year ground temperature. At one metre’s depth, the average soil temperature in the UK remains consistently at 10–13°C. Pipes are sunk into the ground via a horizontal loop, borehole or even a deep lake and the water and environmentally friendly anti freeze (Glycol) which runs through the pipes, absorbs the thermal energy from the ground as it passes through. This is then circulated through the heat pump where it is converted into useable energy to heat your home or hot water. These systems work by extracting excess warm air from your kitchen, bathroom or utility room. Cool air is discharged from the system to the outside of the property and the heat is retained in the system for heating hot water or the heating system. Improved circulation of air and ventilation is also achieved throughout the property using this system. It is suitable for smaller properties or apartments and flats where there is no access to an outside area. Heat pump service & repairs can be carried out by Quantum Energy Systems for the following heat pumps brands. Air to water heat pumps absorb the heat from the outside ambient air and convert it to be used to heat hot water or heating systems. They are located outside the property and are ideal if there is not enough room to sink a borehole or install a ground loop. They are easy to install and provide a convenient and cost effective method of additional heating in conjunction with a conventional heating system or solar panels. They should be positioned at least 300cm away from the outside wall of the property or can be installed up to 25 meters away, preferably in a south facing location.